Switching your canine companion from wet food to dry kibble is not something that you can do overnight. For best results, and to avoid causing your furry pal a digestive upset, you don't want to rush the transition period between the old and new food. While your dog may be resistant to the change at first, you can help it gradually become used to the dry food. The way that you present the kibble to it at mealtime will have a large influence on its acceptance of the switch. Put 75 percent of the wet food and 25 percent of the new, dry food into your dog's dish at feeding time. For instance, if you feed it 1 cup of wet food per meal, give it 3/4 cup of wet and 1/4 cup of dry. Continue this pattern for three additional days. Monitor your dog for vomiting during this transition. If it vomits, feed it the 75/25 percent mixture for an additional day or two past the third day, for a total of four days. Feed your dog a 50/50 mix of wet and dry food for four more days. Monitor the animal for vomiting or skin rashes. Contact your dog's vet immediately if the problems persist. Adjust the mixture to 25 percent wet food and 75 percent dry for one day. Increase the dry food quantity by 10 percent each day, while decreasing the wet food percentage by 10 percent until you are feeding your canine 100 percent dry kibble. For example, feed 85 percent dry and 15 percent wet, then 95 percent dry and 5 percent wet. Finally, feed it 100 percent dry and 0 percent wet food. Feed your dog in the same place, at the same time each day. Speak in an encouraging tone to your canine when feeding it. It will be much more likely to give the new food mixture a try if you present it in a positive manner. Never try to make a transition in fewer than seven days. It can cause unpleasant symptoms such as stomach upset, diarrhea and diminished appetite. A wet-to-dry food transition may cause constipation in some dogs due to the reduced liquid content in their diet. Add 1 to 3 tbsp. of warm water to the dry kibble to moisten it if your dog seems to be having constipation issues. 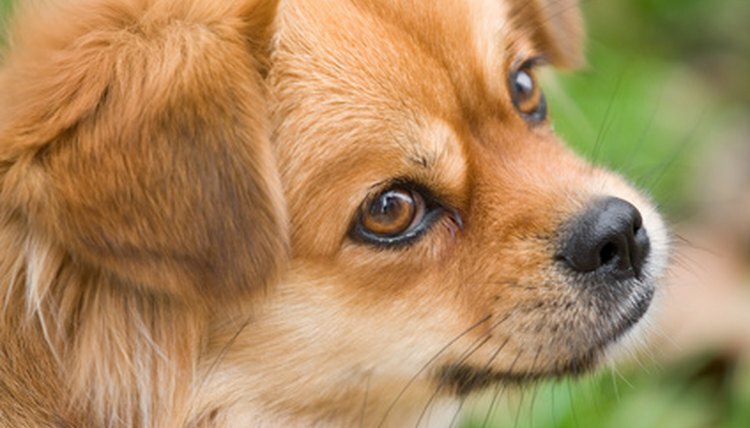 Not only will your dog receive extra liquid, it also may make the dry food more appealing. Discard water-moistened food after 20 minutes because it will spoil. Avoid giving your dog treats or table food during the first two or three days of the transition. It will make it more difficult for it to accept the new food.